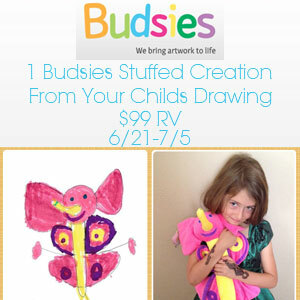 Choose a drawing for your Budsies either from the templates provided online or your child’s custom creation. Upload the artwork or take a picture with your smartphone and send it via text message or email. Receive your custom stuffed animal in approximately 5 weeks. I have no idea. He loves everything! This is great! I’m always telling my granddaughter what an amazing artist she is and to see one of her own pictures come to life would really inspire her. I don’t know what he would choose, but I’ve archived every art piece he has from school via pictures, so we have lots of choices.